This may seem like an odd subject to be writing about. However, I figured that everyone has, will or may need to at the moment hem a pair of pants. Do you ever look at the hem of your pants? Well, different pants are hemmed different ways! 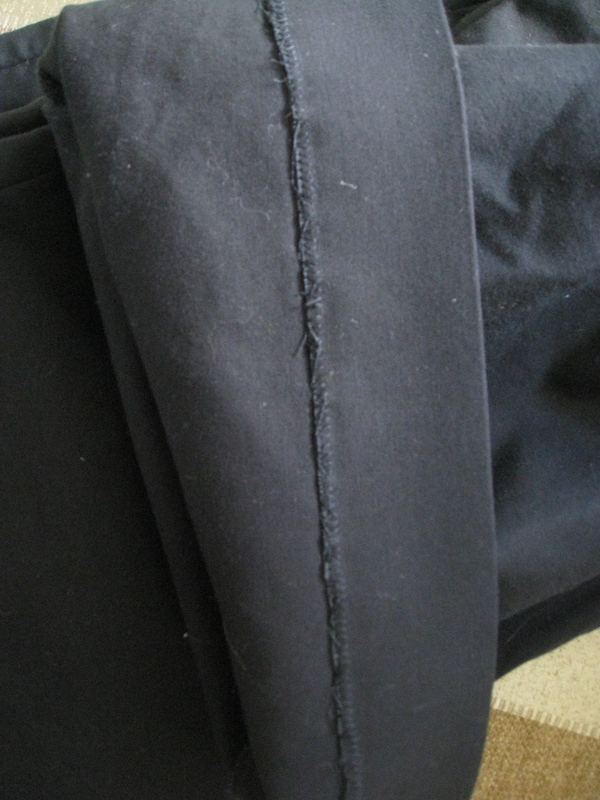 Her dress pants had a HIDDEN seam so that you can't actually see that they're sewn on the outside. Do you know what this means? This means that you have to HAND SEW this kind of hem. Guess what? I despise hand sewing. Or I should say, despise-ED. I wouldn't classify myself as an impatient person, however, if there is a faster way to get something done, I'm all about it. That's why we have things like sewing MACHINES. Here's my crazy workspace. 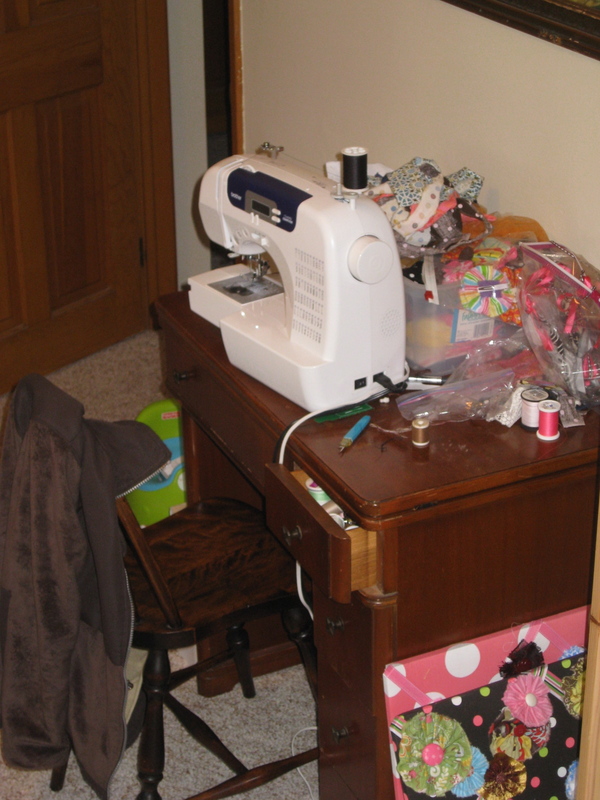 Our winter project is to get my sewing room fixed up and organized! Can't wait! Why hand sew if it can be done via machine? Well, as it turns out, not everything can be done that way. I learned how to do the hidden hand stitch via a training video on youtube. It's not difficult. Not as quick as a machine, but they turned out quite nice! Don't you think? If you're not a sewer, hand or machine, there is another way! You heard me right! I know that you're going to go to sleep tonight thinking, "wow, my day was complete when I read Tina's blog on hemming!" Ok, not really. But there is this cool stuff called "Therm O Web Heat n Bond Iron-On Adhesive." It can be purchased at Wal-Mart™. It's only a few bucks for a pack of several yards. There are two types: "super" and "regular". The "super" is used on heavy fabrics such as denim, wool, corduroy, and suede. The "regular" type is thinner in width than the "super". It's recommended for light fabrics such as cotton, rayon, and acrylic. There are several tutorials online (if you need one) on how to use this method. So there you have it folks. Hem away. Just don't haw. It's not becoming. Quiet about this, but my husband actually got a sewing machine recently for this very purpose. He has done 2 or 3 pairs of jeans so far, which is an accomplishment (not quite as easy as he thought). 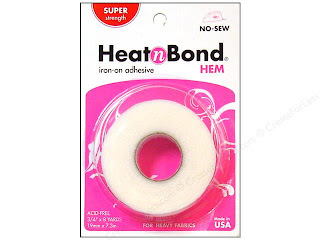 We did buy some of the adhesive, as well as some stuff to prevent shredding if you have to do cutting before the hemming (especially on jeans). By the way, if you are going to get a sewing cabinet for your newly organized room, check out the ones that my previous employer makes: http://www.arrowcabinets.com/ and http://www.kangarookabinets.com .